Clogging indicators provide a visual or electrical indication of hydraulic fluid filter element clogging and can be provided with several features compatible with autonomous systems and hazardous duty locations. 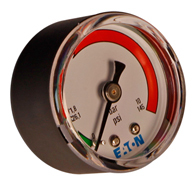 The simplest form of clogging indicator is a vacuum gauge with custom dial having a green and red range; when operating within the green portion of the scale the filter element is working within its design specifications. As the pointer travels further into the red portion of the scale its an indication that the element has become clogged and that it needs replacement. It is important to note that a continuous source of particulate has the effect of clogging the element at an exponential rate, thus it is important to change the element as soon as possible, otherwise there is risk of reduced flow or over-pressurization. The visual gauge can be combined with electric switch to provide an alarm signal or enable some other device, such as an automated shut-off valve to function. This is especially useful when the filter housing cannot be readily viewed. The AE and AOR/AOC series represent the different types and configurations available such as optical, electrical, optical-electrical with block or threaded body having reset and control functions and can satisfy explosion-proof requirements.